1790’s-1832 The first structure was probably a brush arbor. Later the second, a rectangular logchurch, was constructed in the middle of what is now the cemetery. The floor was hand packed dirt and there was probably no heat. The name of the swift flowing creek, still located near the church, seems to have been named in honor of one Henry Neely, or Knealy, who lived on the Lancaster side of the river (1755). Thus the beloved name the church bears today. 1832-1907. The third church was a sturdy white frame building with hand stones as a foundation. Their Session house was a separate building in the middle of the cemetery. The women sat on the right, men on the left, and a section in the rear of the church was reserved for blacks. Twenty or more slaves were members of the church. The stones from the foundation of the church now mark the spot where the pulpit stood but unfortunately there is no inscription on the marker. In 1893 the congregation numbered 196. 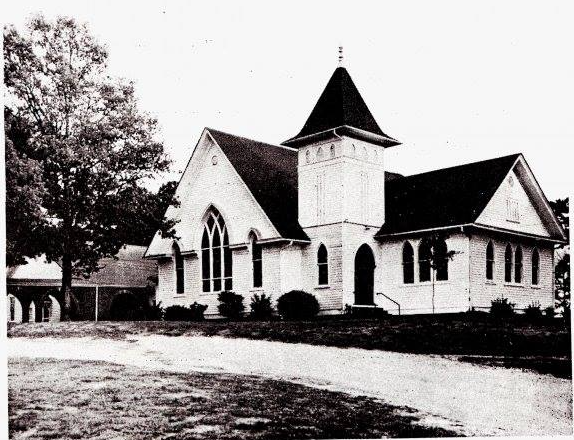 1907-1973 The fourth church was a handsome frame structure, elegant and beautiful for that day and time, costing about $7,500. The woodwork of the interior was dark oak with white pine for the ceiling. There were cathedral stained glass windows, carved pulpit and chairs, and a special choir loft that made a worshipful setting for everyone. 1973 – The fifth and current church. Today we worship in the beautiful sanctuary that seats 500, including the balcony. A stained glass window made from selected windows from the fourth church building was placed in the center of the Chancel wall behind the choir forming a focal point for the worship area and symbolizing a tie between the old and new buildings.